Definitely falling into the category of a Claudefest, Lifelike Decals have recently released three sets of decal sheets featuring no less than 38 different markings schemes in total for the iconic Claude, a veritable cornucopia of colour. A5M2b early, 3-154, Houkoku-125 (Daiichi Sumitomo Go) of 12 Ku, Kong Da, China, 1938 - a closed canopy aircraft in silver and red with a camouflaged cowling. A5M4, W-100 of Flight Commander, Soryu Fighter Group, probably Japan, December 1939 to early 1940 - in silver and red with black and white trim and black wheel spats. A5M4, W-107 of Soryu Fighter Group, Fall 1940 to Spring 1941 - in silver and red with narrow red fuselage band and yellow tail stripe. A5M4, 9-151 of Lt Motonari Suho, Buntaicho in 14 Ku, Naning, China, December 1939 to early 1940 - in silver and red with red and white fuselage band. A5M4, K-112 of Kaga Fighter Group, South China Sea, late 1938 - in silver and red with blue fuselage band. This aircraft also has a red longitudinal fuselage stripe. A5M4, T-152 of Tsuiki Ku, Tsuiki, Autumn 1942 - in silver and red with blue fuselage band. A5M4, CII-102 of Hosho Fighter Group, April 1941 to March 1942 - in silver and red with red longitudinal fuselage stripe. A5M4, CI-106 'Iso' of Zuiho Fighter Group, Sasebo, March 1941 - in silver and red with yellow fuselage band and tail code. This aircraft also has a red longitudinal fuselage stripe and the white kanji character 'Iso' (磯) painted inside the fuselage Hinomaru. A5M4, ヨ-186 ('Yo'-186) flown by A1/c Hideo Oishi of Yokosuka Ku, Yokosuka, December 1939 in silver and red with white trim. A5M4, 2タイ-103 ('Ta-i'-103) of Tainan Ku (2nd generation), Formosa, February 1944 to February 1945 - a training aircraft in dark green over grey-green. A5M4, カ-130 ('Ka'-130) of Kasumigaura Ku, Matsushima Detachment, Matsushima, January 1944 - another training aircraft in overall orange with a special rollover fairing fitted behind the cockpit. There are two sheets in this set, with one providing the various Hinomaru. As usual with Lifelike, each subject is described with a note clearly stating the reference sources and any elements of the markings which are deductive or speculative, together with a brief biography of the pilot where appropriate. A5M2b late, 3-108, Houkoku-212 (Teikoku Selmei Go) flown by A1/c Kyosaku Aoki, 12 Ku, Anking, China, 1938 - in silver and red with red and white fuselage band. A5M2b late, Houkoku-218 (Heihoku Kanri Go), probably 14 Ku, Sanzao Do, December 1938 to early 1940 - in silver and red with red and white fuselage band. Unusually this aircraft has the Houkoku legend repeated across the fin and rudder. A5M2b late, 3-162 flown by A1/c Kezuo Tsunoda, 12 Ku, Anking, China, August 1938 - in silver and red with red and white fuselage band and red wheel spats. A5M4, W-121, Houkoku-307 (Koku Keiki Go), Soryu Fighter Group, probably Japan, November 1939 - in silver and red with red fuselage band and diagonal blue and white fuselage band. A5M4, Houkoku-317(Miyagi Suisan Go), 14 Ku, Haikou, China, Autumn to early December 1939 - in silver and red with red and white fuselage band and white tail stripes. Another aircraft with the Houkoku legend repeated across the fin and rudder. A5M4, 9-137, Houkoku-317 (Miyagi Suisen Go), 14 Ku, Nanning or Hankow, China, January to August 1940 - in silver and red with red and white fuselage band and white tail stripes. 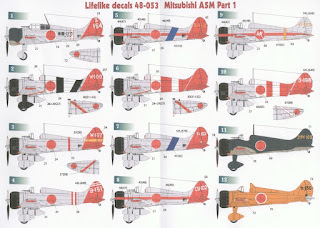 A5M4, S-160, Houkoku-367 (Daini-Tokyo-Kamisho Go), Chitose Ku, Roi Island, October to November 1941 - in silver and red with blue and white tail stripes. A5M4, S-153, Houkoku-373 (Isetan Go), Chitose Ku, Roi Island, October to November 1941 - in silver and red with broad blue fuselage band. A5M2b late, 9-176, 14 Ku, Nanning, China, December 1939 to January 1940 - in green and brown camouflage over silver with red tail. A5M4, リ-114 ('Ri'-114), Houkoku-170 (No.32 Zennihon Go), Hyakurihara Ku, Hyakurihara, 1940-1941 - in silver and red with overpainted fuselage band. A5M4(? ), ス-151 ('Su'-151), Suzuka Ku, Suzuka, 1940-1941 - in silver and red with non-standard red demarcation on tail. A5M4, G-102, Genzan Ku, probably Woosan, Korea, November 1940 to September 1941 - in silver and red. A5M4, オタ-163 ('O-ta'-163), Oita Ku, Oita, 1943 - in silver with red wheel spat flash and nose trim. 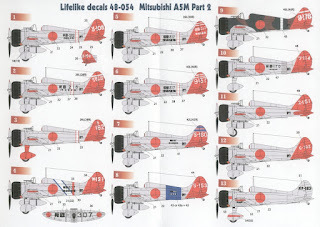 The two decal sheets included in this set and in the others are crisply printed for Lifelike by Microscale and both the register and colour saturation looks very good, with the correct colour red presented for the Hinomaru. 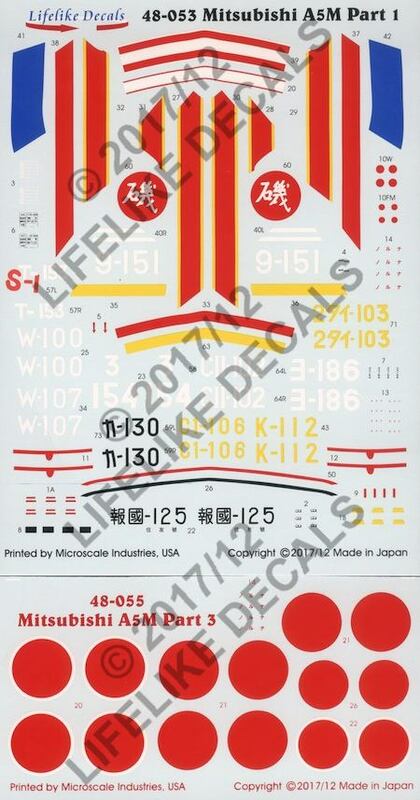 The blue fuselage band on subject 8 must be painted on by the modeler but Lifelike provide silver panels as decals as well as positive and negative templates to mask and apply the Houkoku legend as desired - a nice touch. A5M2b early, 3-155, Houkoku-126 (Daini Sumitomo Go), 12 Ku, Kong Da, China, 1938 - a closed canopy aircraft in green and brown camouflage over grey-green with white fuselage band and tail code. A5M2b late, 10-113, Houkoku-188 (Daisan Chuugakusei Go) flown by A3/c Yukio Aiso, 15 Ku, Jiujiang, China, September to December 1938 - in silver and red with red and white fuselage band. A5M4, W-101, Houkoku-260 (Fujisawa Go) flown by Lt Tamotsu Yokoyama of Soryu Fighter Group, Japan, November 1939 - in silver and red with red fuselage bands and Hinomaru flag (the Hinomaru for the flag is provided as a decal). A5M4, W-102, Houkoku-261 (Yoshida Go) flown by A1/c Matsuo Hagiri of Soryu Fighter Group, Japan, November 1939 - in silver and red with red fuselage band. A5M4, W-102, Houkoku-266 (Iwai Go) flown by A1/c Hideo Oishi of Soryu Fighter Group, Japan, November 1939 - in silver and red with red fuselage band. A5M4, W-114 of Soryu Fighter Group, East China Sea, November 1938 - in silver and red with red fuselage band and diagonal black fuselage band (not supplied as a decal). A5M4, VII-III, Houkoku-348 (Daini Jokyoin Go) of Soryu Fighter Group, Kasanohara, early 1941 - in silver and red with red and white fiselage band and diagonal blue fuselage band, wing stripes and wheel spat trim. The spats have to be painted but the white and blue edging is provided as decals with alternates designed to fit either the Fine Molds or Wingsy kits. A5M4, VII-119, Houkoku-386 (Daiichi Fukui Orimono Go) of Soryu Fighter Group, Kasanohara, early 1941 - in silver and red with red and white fuselage band and white, blue edged fuselage band, wing stripes and wheel spat trim. The wheel spats are dealt with as for subject 7. A5M4, Houkoku-278 (Osaka Gas Go), 14 Ku, Sanzao Dao or Haikou, China, Summer 1939 - in silver and red with red and white fuselage stripe and white tail stripes. The Houkoku legend is repeated across the fin and rudder. A5M4, 9-158, Houkoku-278 (Osaka Gas Go), 14 Ku, Haikou, China, Summer 1939 - in silver and red with black and white fuselage band (provided as a decal). A5M4, QI-107, Houkoku-295 Dainippon Moufo Go) of Soryu Fighter Group, Sanya, Hainan Island, September 1940 - in silver and red with red fuselage band. 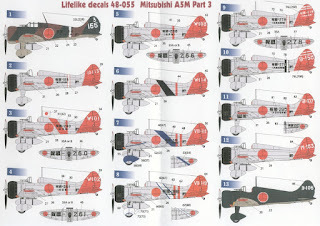 A5M4, M-103, Miho Ku, Miho, October 1943 to June 1945 - a training aircraft in silver and red. A5M4, カ-105 ('Ka'-105), Kasumigaura Ku, Kasumigaura, Autumn 1943 - another training aircraft in dark green over grey-green with white tail code. 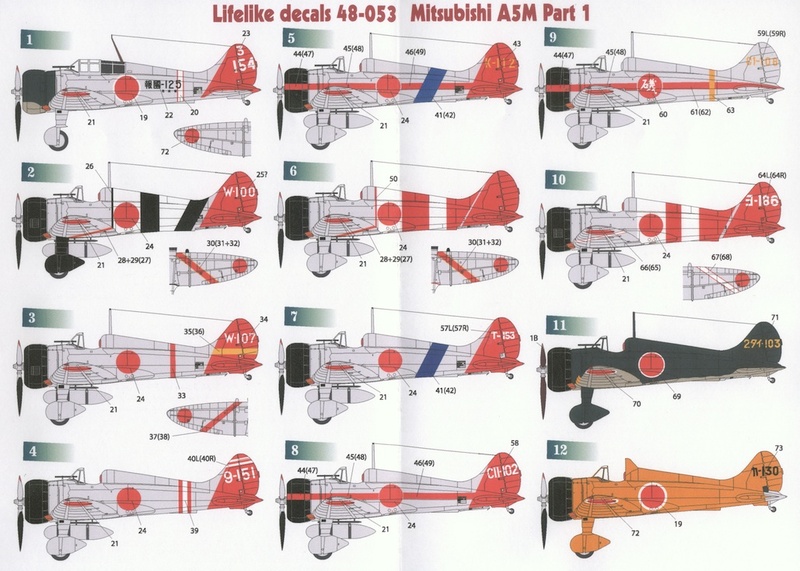 Seven of the 13 subjects in this set of three sheets are for aircraft of the Soryu Fighter Group, including three very colourful examples. But on all the sheets some of the lesser known units are included which might otherwise be difficult to model. The attention to detail is shown by the alternative trim decals for the Fine Molds or Wingsy kits. The number of subjects provided suggests joint purchase and/or sharing to avoid waste but no doubt some Claude enthusiasts will invest in all the sheets for the sheer choice of subjects and the very useful reference notes. I hope that in due course we might also see them available in 1/72 scale. 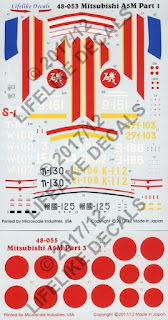 Lifelike's painstaking trio of decal sets is an excellent enhancement for the recently released Claude kits in 1/48 and highly recommended. With special thanks to Keishiro of Lifelike for these review samples. Thanks for posting this Nick. I have sheets #1 and #3, and the quality is superb. 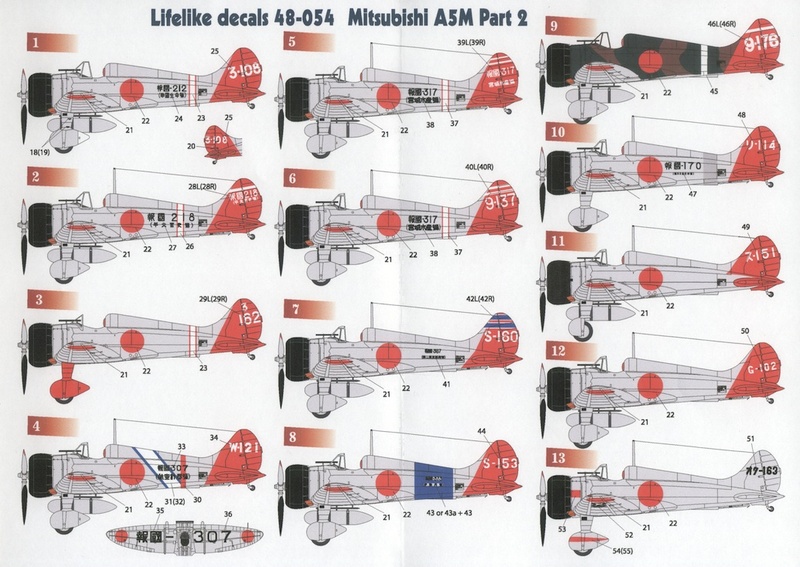 That goes for the decals themselves, as well as the research in the instructions. It's going to be difficult to figure out which one to build first! I now have these in hand, and taken together they are a remarkable trio. If you've already invested in the Fine Molds or Wingsy kit, snagging one or all of these is recommended. (I noticed on the Lifelike website that the Ki-27 Nate trio of sheets is already sold out). 'Painstaking' is indeed a good word to describe these. 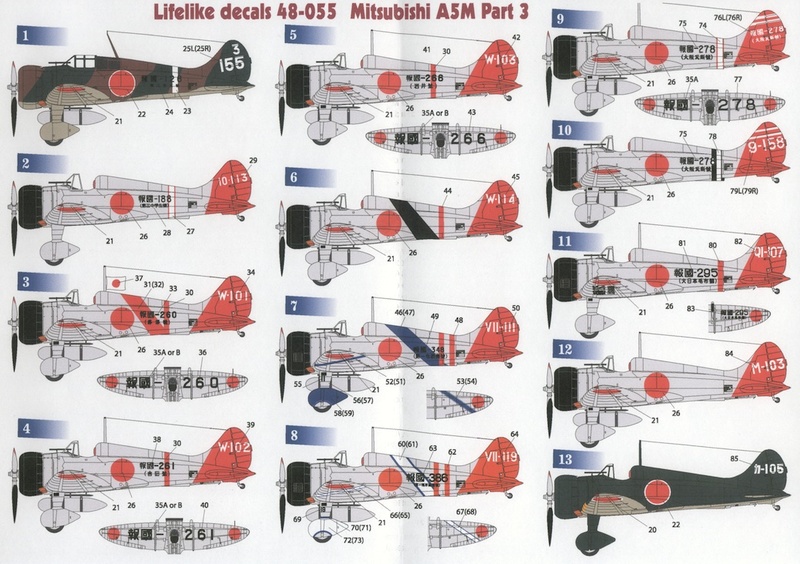 The notes for each aircraft are always a highlight with Lifelike decals; I like the way Nagao san lets the modeler know how he has reached certain conclusions when photographic evidence is slim, and also points to where those sources can be found. He is an admirable sleuth who encourages the builder to follow suit.